CEDAR CITY — Bolstered by strong showings in recent meets, Cedar High’s girls track team is hoping its momentum will continue during the upcoming region and state championships. Leading the way for the Lady Reds is senior Julia Hunt, who captured multiple first-place finishes at the Cedar Invitational April 27-28 and at the Brigham Young University Invitational in Provo May 4-5. 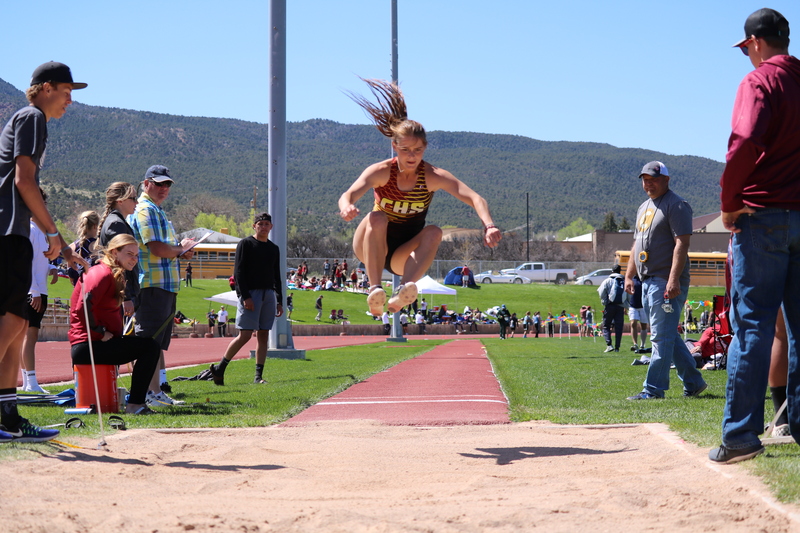 Hunt won the long jump at the Cedar meet with a leap of 18 feet exactly, then nearly matched that distance at the BYU Invitational with a leap of 17 feet, 11.75 inches, earning her first place among athletes in the larger schools category (4A through 6A). A couple weeks earlier, on April 13-14 at Desert Hills, Hunt had recorded a leap of 18 feet, 3.5 inches, which is reportedly the top female performance in the state so far this year. Hunt also won the 100-meter dash at the Cedar meet, posting a time of 12.97 seconds. The following weekend at BYU, she had the top qualifying time in the 100 meters, clocking 12.47 seconds on Friday. Then, in Saturday’s final, she won the race in a time of 12.35 seconds. In addition to being a jumper and a sprinter, Hunt is also a top hurdler, most recently placing second in the 300-meter hurdles at the Cedar meet with a time of 46.17 seconds. At the BYU Invitational, Cedar’s 4×400 girls relay team took first place with a time of 3:52.93, besting runner-up Provo High by more than three seconds. The mark also broke Cedar’s 20-year-old school record by 4.5 seconds, Davidson said. Running in that relay, in order, were Rachael Hunt, Lexi Bird, Julia Hunt and Jasie York. In addition to anchoring the relay, York, a junior, placed second in the 400-meter run at the BYU Invitational, her time of 55.63 being the second-best time among 4A runners in the state this year. At the Cedar meet, York took second in the 100-meter dash with a time of 13.42 seconds. Rachael Hunt, also a senior and who is Julia’s twin, has joined with her sister in signing letters of intent to play soccer for Snow College this fall. The Cedar girls scored 53 team points at the BYU Invitational, placing them second overall out of 42 schools in the larger schools category. Cedar also placed second at its home meet the previous weekend, scoring 120 points to winner Box Elder’s 122. For complete results of the BYU Invitational, click here. For full results of the Cedar Invitational, click here. Notable performances by Region 9 male athletes at the BYU Invitational included senior Tae Washington of Snow Canyon winning the 100-meter dash in a time of 10.57 seconds, a new state 4A record. He edged East High junior William Prettyman, who finished in 10.61 seconds. They in turn were beaten by Dallin Draper of 3A’s Delta High, who posted a time of 10.53 seconds, reportedly the second-fastest time in Utah state high school history. Also at the BYU meet, Washington placed second in the 200-meter dash with a time of 21.45 seconds, with Prettyman taking first in that race with 21.36. Washington has signed to run track for Utah State University starting this fall. 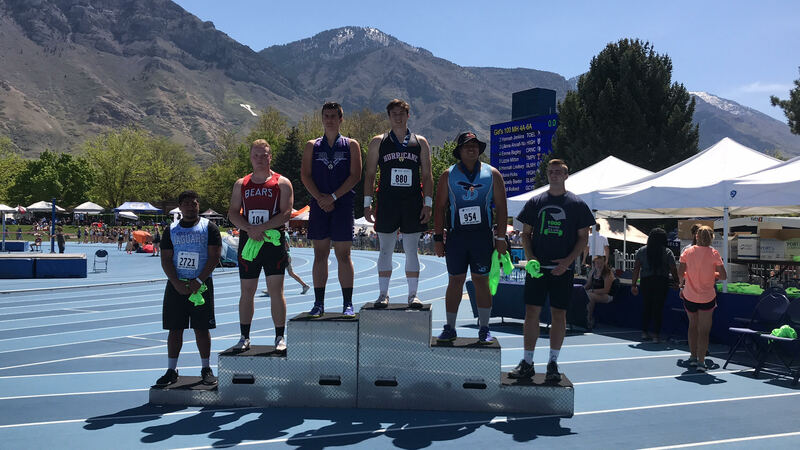 Hurricane High senior Stephen Campbell won the shot put at BYU with a top throw of 53 feet, 3.25 inches, narrowly edging Lehi’s Trey Andersen, whose best throw was 53 feet, 3 inches. Campbell won the event on his sixth and final attempt. Also at BYU, Campbell took second in the discus with a throw of 154 feet, 7 inches, that also coming on his sixth and final attempt of the meet. The only athlete to throw farther at the BYU meet was Brison Tilo of Canyon Ridge, Idaho, who had a throw of 157 feet, 0.25 inches. In addition, Cedar High’s Trenton Maurer, a senior, placed first in the 110-meter hurdles at the BYU Invitational with a time of 14.73 seconds. 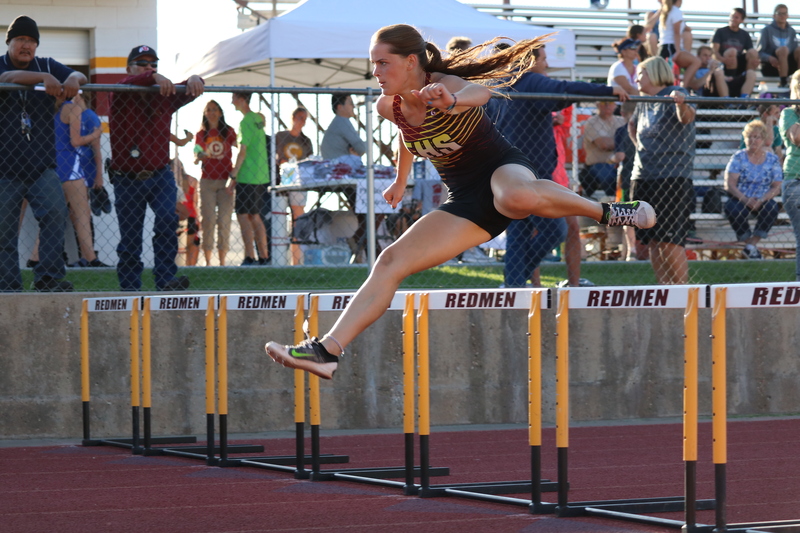 This week, Region 9 schools will compete at the region championships at a two-day meet Wednesday and Thursday at Dixie High School, starting at 4 p.m. both days. The state championship track meet is scheduled for May 17-19 at BYU.